It’s a space that most of us associate with tending plants, children running about, or having friends round for the odd barbecue. But with affordable, chic, eco-friendly outdoor rooms in greater demand than ever, the humble back garden is fast becoming a place of work as well as play. For Ireland’s remote workforce — currently estimated at 220,000 according to e-workers’ network, Grow Remote — the benefits of avoiding the daily commuter grind, not to mention the small monthly fortune saved on takeaway coffee and sandwiches, are among the benefits of working from home. However, teleworking has its drawbacks too. Losing a room in the house encroaches on living space, and can leave the hard-pressed worker with the feeling of being forever on the job. That’s why more people are opting for an outdoor room, a place that can be used as a workspace or office where they can close the door on the distractions of home life and get the sense of going out to their job, even if it is just a few steps door-to-door. 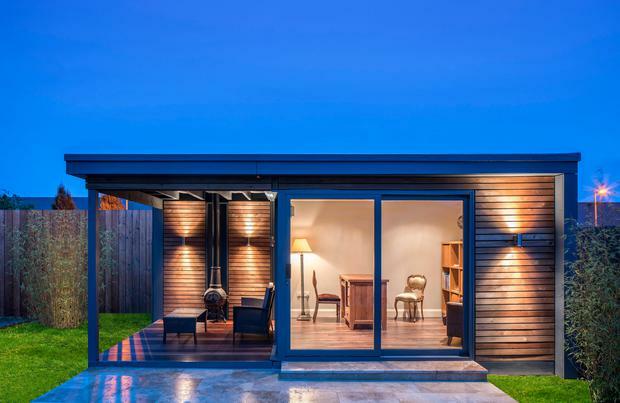 Seán Brett, CEO of Steeltech Sheds, which branched out into garden rooms and chalets 10 years ago, reckons the cost of an outdoor room would pay for itself in savings made by not commuting. When Ann-Marie Collins set up a photography studio next to her house in the East Cork village of Ballymacoda, she did so with some trepidation, fearing the remote location might be a hindrance to business. Instead, amcphotography.ie has developed into a thriving business, specialising in photographing newborn babies. Ann-Marie now has so many doting parents willing to drive hours to have her capture treasured memories of their precious bundles of joy, she now finds herself booked out two months in advance. “I started the business nine years ago, after my first daughter was born,” she recalls. “For the first seven years, I operated out of a small shipping container that I adapted as a studio. It wasn’t ideal, because it had no natural light, but it got me started. By last year the business had grown to the point where I could afford to buy a high-spec Steeltech studio for €25,000. The difference is like night and day. Inspired by her new studio, Ann-Marie set up a second business from the premises, selling essential oils and giving classes in how to use them. “Having the studio has opened another door for me, and demonstrates how a simple outdoor room can boost your business, even in the remotest corners of the country,” she says. Shomera is one of the longest established names in the business, trading in outdoor rooms for 20 years. “We learned a lot as we went along,” says managing director Frank O’Sullivan. “We know what works and developed our MePad range to offer a better value proposition through economies of scale. A typical outdoor room costs from €15,000 for a space the size of a box room in a three-bed semi to €35,000 for a 25 sq m room, the equivalent of two medium-sized bedrooms. In Sallins, Co Kildare, artist Zita McGarry Kelly used to paint in an old shed, until she had a Shomera MePad installed in her back garden four years ago. “It’s so beautiful, it made me up my game as an artist,” she says. “I used to be scruffy, like the shed, but being in this lovely, warm, tidy space has made me more controlled, adding depth and definition to my work. It’s like buying a good quality car after driving an old banger for years. I love it. Kara Cramp knows just how tricky the demands of a working mum can be. Last year she left her job as an economist and analyst working with leading banks like JPMorgan Chase and Bear Stearns to set up Pod Office Solutions. The company makes portable, galvanised steel rooms which can be either fixed into the ground, or installed on supports and craned elsewhere if the need arises. In her view, the technological revolution is fuelling the rise of remote working, and the benefits are wide-ranging, among them an easing of traffic congestion, rural regeneration, reduction in carbon footprints, and increased productivity in home-based workers who have a separate space to the home. A basic 2.4m x 2.4m pod costs €15,000, but the most popular sizes are 3.6m x 2.4m (12ft x 8 ft) and 4.8m x 2.4m (16ft x 8ft). To have these fully fitted out with WiFi, heating, air conditioning, galvanized flooring, paint and electrics costs from €25,000. After six months in business, so far the company has sold three domestic pods and 10 commercial units, with 15 more in the pipeline. Work is not the only reason people are opening up to new possibilities in their own back yard. Once the preserve of wealthy landowners who built follies on the grounds of large estates, modern outdoor rooms are popping up in average -sized gardens for all manner of uses such as games rooms, home gyms, cinemas, studies, teenage dens, art studios, craft workshops, music rooms and quiet retreats. John Sherry set up Garden Rooms 15 years ago, having spotted a trend while selling office furniture in his previous job. One of his happy customers is Sharon Curtin, who decided earlier this year with husband Paul that their four children, aged from 17 to eight, needed space of their own at their home in Dublin’s Clonskeagh. “We didn’t want to move house, so we decided on a garden room,” she says. “There’s a desk at one end of the room, where our 17-year-old son Jack studies for his Leaving Cert. There’s also a PlayStation and an L-shaped sofa, where he and his friends hang out a lot. Our daughters use it for movie nights. Sometimes their pals come round in their pyjamas and watch a movie until 9pm. You don’t need massive space to accommodate a garden room. Readymade, architecturally-designed units in durable wood and steel come in a range of sizes up to 25 sq m, which are exempt from planning permission. With planning, the options are limitless, with scope for business, extra living space, or a granny flat, for instance. Be warned however, for according to those in the know, it is notoriously difficult to get planning permission for garden rooms. That’s why manufacturers design their readymade ranges up to the maximum exemption limit — no more than 25 sq m floor area, no higher than 3m, and with at least 25 sq m garden space remaining after construction. Not surprisingly, given the planning restrictions they work under, manufacturers and suppliers in this area tend to view Ireland’s planning laws as belonging to a bygone era, not fit for purpose, and stifling the potential for outdoor rooms to address the country’s critical accommodation needs. “Small amendments to our current legislation could make life easier for a lot of people and help those in need,” says Kara Cramp. “Coming from an economic background, I’ve written eight proposed legislative changes to planning permission to allow for units like these to meet a growing need for office and residential accommodation, and sent them to Housing Minister Eoghan Murphy and other TDs. With mounting pressure to tackle the deepening housing crisis, perhaps policy makers will find that some solutions are closer to home than they realised.